The Kalihi Palama HCC will be holding its ‘ohe kapala workshop on October 29, 8:30 a.m., at the Community of Christ Church, 1666 Mott-Smith Drive, Honolulu. Here’s an update on our ohe kapala workshop. Met with Aunty Moana, our kumu ohe kapala on Sunday. Pamai was kind enough to drive me and ended up spending the whole day with us to dry run the process. Good thing we did because the block design that we were going to use didn’t work, and so we had to figure out a basic ‘ohe design to represent our club in order to purchase the necessary materials for Saturday. We settled on using ‘ohe kapala named “hiapo” representing our kupuna, nalu li’ili’i and Kilihune, both representing wai from the mountains and from the ocean and the rains of Kalihi. The design would also include a design of your personal choice…we have several ‘ohe kapala that you can use or if you have a favorite, bring with you. Too, you may use the one that you carve on Saturday. We learned that this isn’t an easy process. 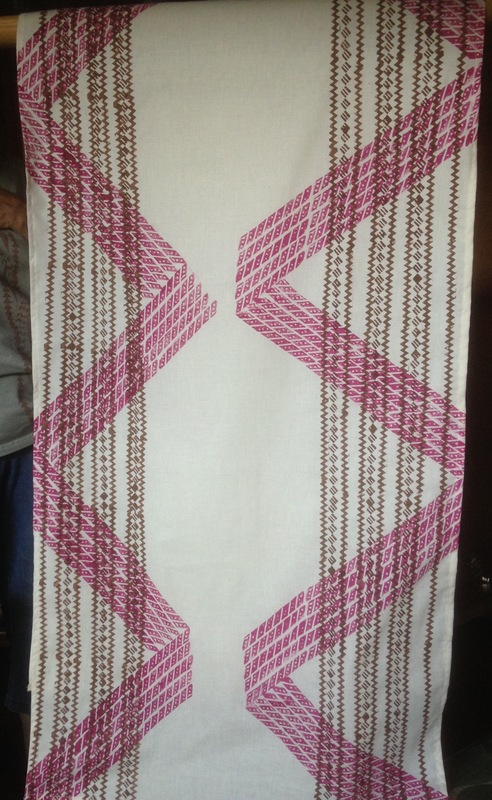 It begins with getting the materials, carving the ‘ohe, marking out the fabric so that you don’t print crooked :), inking the ‘ohe, printing the fabric…and praying the whole time that you do it right 🙂 Aunty Moana is confident that we can do it!!! On Saturday, I will explain to everyone our experience and seek your support of the basic design. It wasn’t easy to decide; took us over two hours of discussion. For the workshop this Saturday, I have only heard from a few of you. Thus, ordered 15 kits for this Saturday’s gathering. If we have more members attend, we’ll share the materials. Minimally, we need to complete at least five for the convention for the club’s officers and directors, or 14 if we are all to use the ‘ohe kapala designed kihei at convention. Here are the folks I have heard from: Kaimo, Tracy, Sherry, Juanita, Betty, and Joe. Additionally, Cissy who advised she will come to the next workshop. Please let me know if you plan to attend the workshop on Saturday. Here’s a prototype of our club kihei. The center would include a personal ‘ohe kapala stamp. This entry was posted in General on October 25, 2016 by Blaine Fergerstrom.